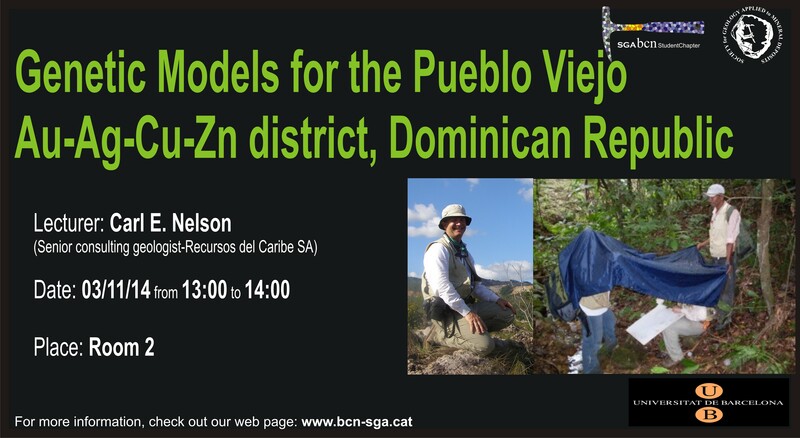 Title: Genetic Models for the Pueblo Viejo Au-Ag-Cu-Zn district, Dominican Republic. Date: Monday Novembre the 3st 2014, 13hs. Abstract: The origin of the Pueblo Viejo deposit has long been a subject of debate. Published models refer to Pueblo Viejo as a Tertiary porphyry copper deposit (Hollister, 1978), a Cretaceous epithermal deposit (Kesler et al., 1981), a Cretaceous maar-diatreme (Sillitoe and Bonham, 1984; Russell and Kesler, 1991); a Cretaceous high sulfidation deposit (Sillitoe et al., 1996), a Cretaceous volcanic dome field (Nelson, 2000a); and a Tertiary porphyry copper lithocap (Sillitoe et al., 2006). A link to VMS deposits is supported by the presence in the Moore pit of massive sulfide layers adjacent to a baked intrusive contact with a dacite volcanic dome (Nelson, 2000b). Surrounding mineral occurrences include both traditional bimodal mafic massive sulfide deposits and epithermal deposits with high sulfidation mineral assemblages similar to Pueblo Viejo (Nelson, 2000). Pueblo Viejo is perhaps best described as a hybrid deposit, with both epithermal and VMS characteristics, in effect, a submarine volcanogenic massive sulfide that formed at shallow depth. 2014 was a year full of timeless memories; enhancing experiences and knowledge broadening activities related to Ore Deposits. Given to last year’s success on the SGA workshop on mineral deposits related to acid magmatism, the enrollment of new members and the motivation of the entire Chapter, we were deeply enthusiast and encouraged to organize our third workshop, this time devoted to Epithermal Ore Deposits, from the 18th to 20th of September. 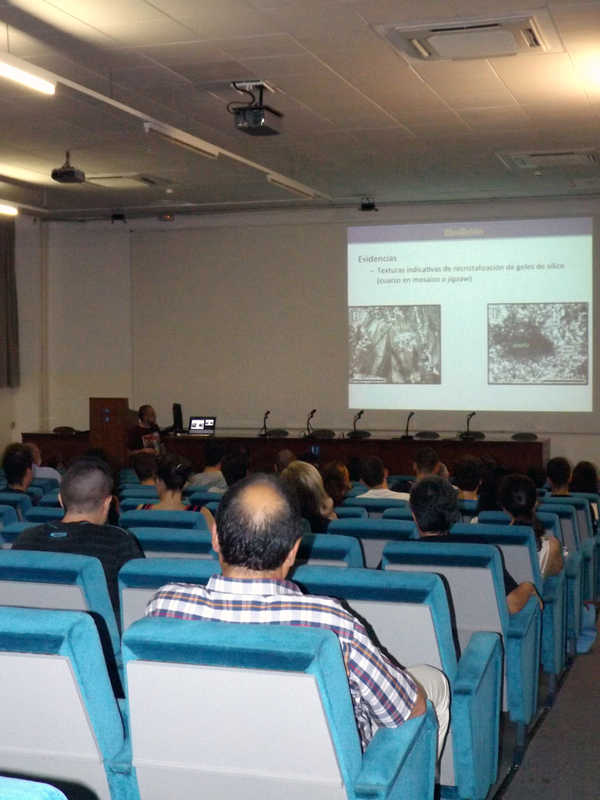 It was held at the faculty of Geology of the University of Barcelona and counted with the total participation of 75 assistants, some of them even coming from Madrid and Granada. The aim of this workshop was to approach and provide a highly-developed survey about these deposits; the structure and formation of both high and low sulfidation epithermal deposits, their geochemistry, mineralogy, petrology and their economic interest to undergraduate, master, doctorate and young research students, as well as to professors, researchers and professional geologists, who were interested in these characteristic deposits and wanted to up-date their knowledge with the latest research on this topic. The first day of the workshop consisted of a stimulating two-hour introductory class imparted by Antonio Arribas Jr, under the title of “Introduction to epithermal gold deposits and their classification”. This lesson was of great profit for students who were non-familiarized with this kind of deposit, due to its straight forward explanation and introduction to their basics. It included one hour of theory and another one of practical lesson, where members could learn how to recognize in hand sample the different alterations of high and low epithermal deposits (Fig. 1). Furthermore, petrographic microscope with reflective light was used to visualize the ores of these ones (Fig. 2). 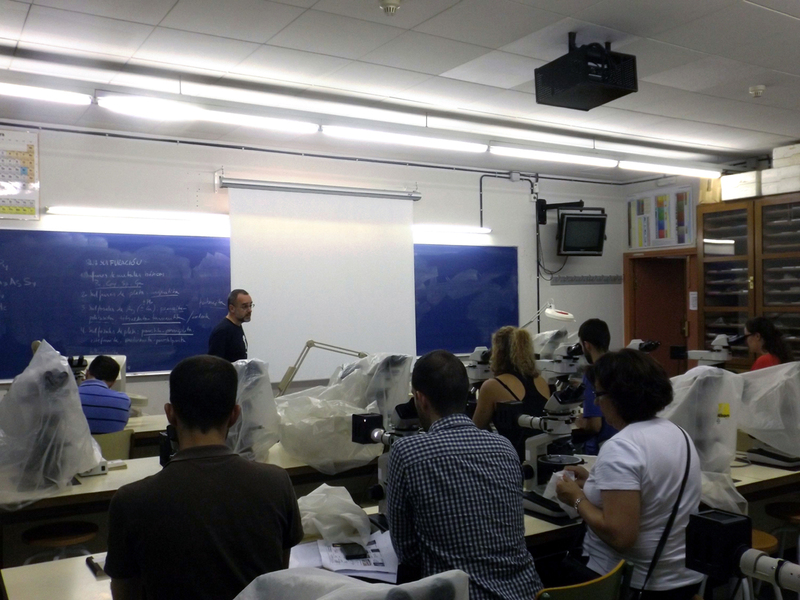 The samples used to carry out the practical lesson came from theFaculty of Geology’s wide collection and from Antonio Arribas itself, who kindly provided some of the spectacular samples he had the opportunity to pick up in the diverse deposits he had worked in. The second day of the workshop held the enlightening lectures given by the invited speakers, recognized International experienced specialists on these type deposits (Fig. 3). Dr. Antoni Camprubí i Cano (Universidad Nacional Autónoma de México-UNAM) opened the session with “Mechanisms for ore deposition in epithermal depòsits”,throwing light upon the complex processes undergoing in these types of deposits, including boiling, conductive cooling, fluid mixing, etc. Moving on to more specific and detailed topics inside epithermal deposits, Dr. Antonio Arribas Jr. (Ann Arbor, Michigan), with his lecture entitled “Au-Ag-Cu high sulfidation epithermal deposits and their relationship to Cu-Au porphyry Systems”, illustrated the structure, alteration distribution and how high sulfidation processes relates to porphyry Systems. Emphasizing and making clear the difference between high sulfidation deposits and intermediate sulfidation ones, Dr. Antoni Camprubí i Cano (Universidad Nacional Autónoma de México-UNAM), declaimed again, but this time with a talk under the name of “How intermediate sulfidation epithermal deposits make sense”, also explaining in detail the characteristics which allows us to differentiate between them and depicting essential exploration guidelines. Finally, Dr. Isaac Corral Calleja (James Cook University, Australia & Universitat Autònoma de Barcelona), with a talk entitled “The Cerro Quema Au-Cu deposit, Azuero Peninsula (Panama): An example of a high sulfidation deposit in a fore-arc environment”, exposed the outcomes he obtained from this particular study case and described the experience he underwent whilst studying one of this type of deposits. To enliven and offer a relaxed and friendly environment, an afternoon snack was provided at the Faculty’s courtyard after the conference sessions, consisting of diverse groceries, mojitos and the music our members bought in. Students enjoyed the opportunity to initiate a closer conversation and agreeable discussions with the attendants to the conferences, asking any doubts about the lectures and sharing their points of view. 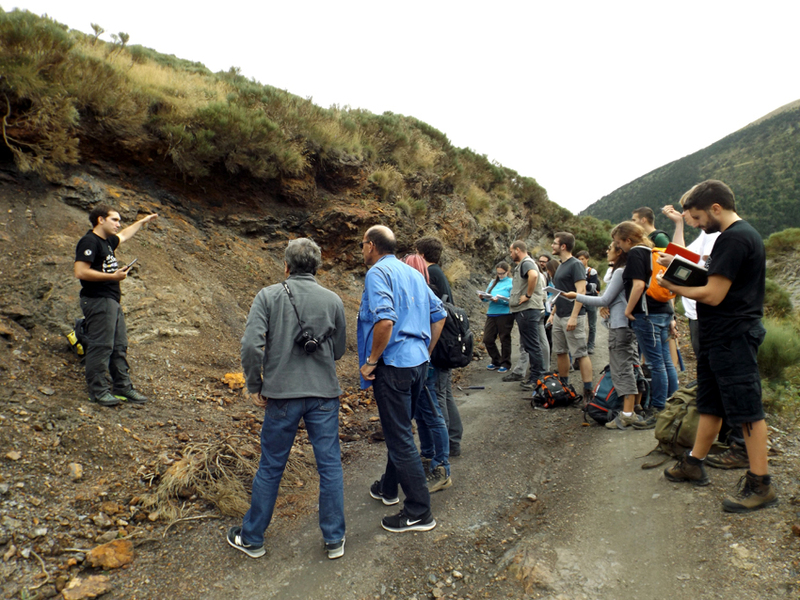 On Saturday 20th, a one-day fieldtrip to different iron mines in Les Bordes de Conflent took place. Leaded by our PhD student member, Marc Campeny (Fig. 4), who acknowledged the mineral deposits of this region in Lleida, all attendants had great pleasure in listening to diverse explanations as the cause of mineralization in this area. Furthermore, we could distinguish copper sulfosalts (tennanite-tetrahedrite), arsenopyrite, pyrite and chalcopyrite mineralizations containing gold associated to shearing in the Pyrenees; the reasons why these mineralizations are largely classified as orogenic gold deposits were exposed and discussed (Fig. 5). In addition, attendants were delighted and extremely relished to take part in a fieldtrip to one of the most beautiful landscapes the Pyrenees offers us. Student members were greatly involved and the lecturers took great appreciation of this participation – leading to a wonderful atmosphere (Fig. 6). What’s more; we had the opportunity to find and pick up exceptional hand samples with idiomorphic tetrahedrite crystals, as well as acquire a full comprehension of functioning of the mineralized system. We gratefully acknowledge all lecturers: Dr. Antoni Camprubí i Cano, Dr. Antonio Arribas Jr. and Dr. Isaac Corral Calleja for their overwhelming speeches, their deep motivation and interest in forming part of our third workshop, to everybody who was involved in it and gave us support. We also express our most true gratitude to the SGA for the economic support offered, which allowed us to develop and carry out successfully all our activities. We would also like to thank the Faculty of Geology for their logistic and economic support, as well as to the SEG, for its collaboration in the process of organization. 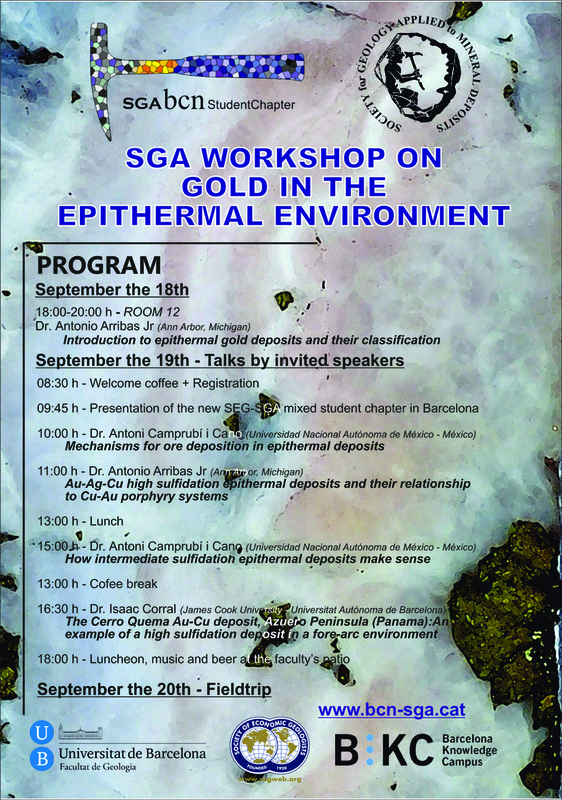 We are yearning to announce you this year's workshop about epithermal deposits! You can find all information about the workshop here. We are looking forward to seeing you in Barcelona! 08:30h- Welcome coffee + registration. 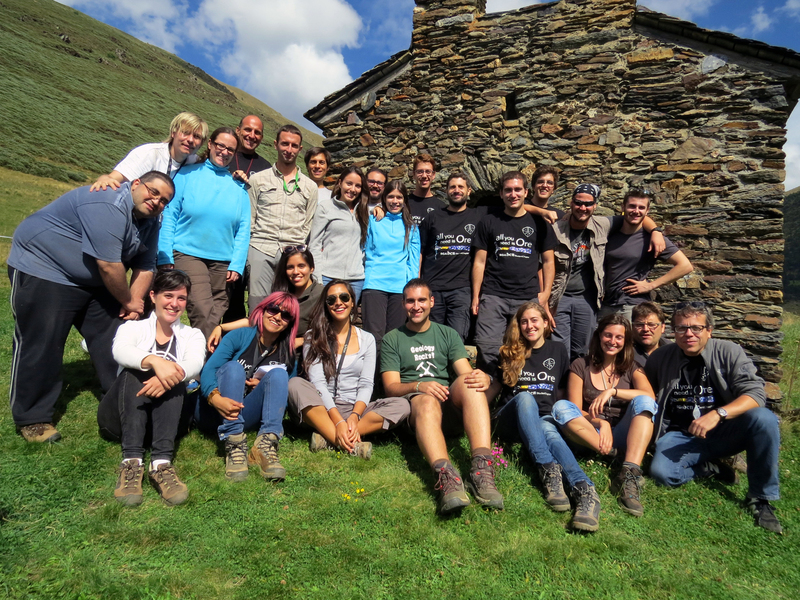 The fieldtrip of the III SGA BCN-Student Chapter Workshop will be carried out in the heart of the Pyrenees. 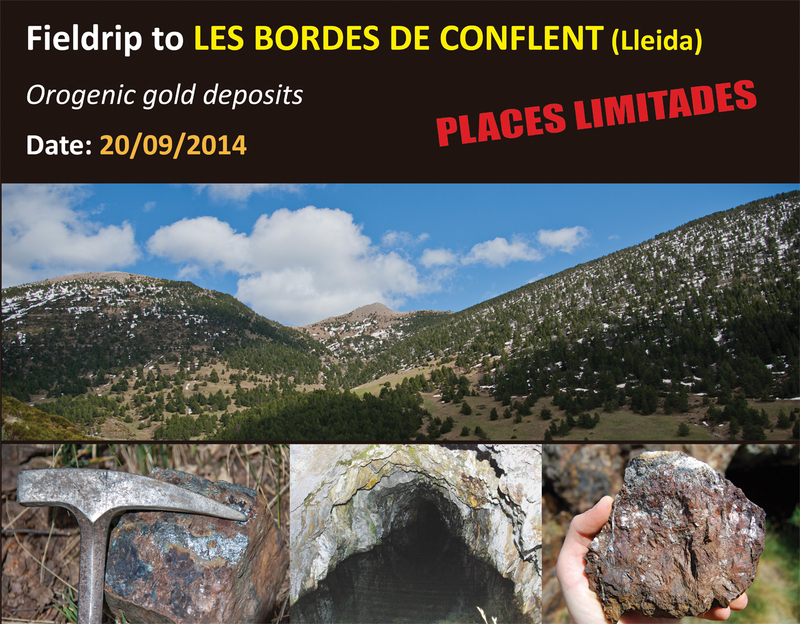 We will visit the iron mines of Les Bordes de Conflent, where it is also possible to distinguish an orogenic gold mineralization associated to copper sulfosalts (tennanite-tetrahedrite), arsenopyrite, pyrite and chalcopyrite. Our colleague Marc Campeny, who has a good knowledge of the region, will guide this fieldtrip. We will meet at the Faculty of Geology the 20/09/2014 at 06:30 am. 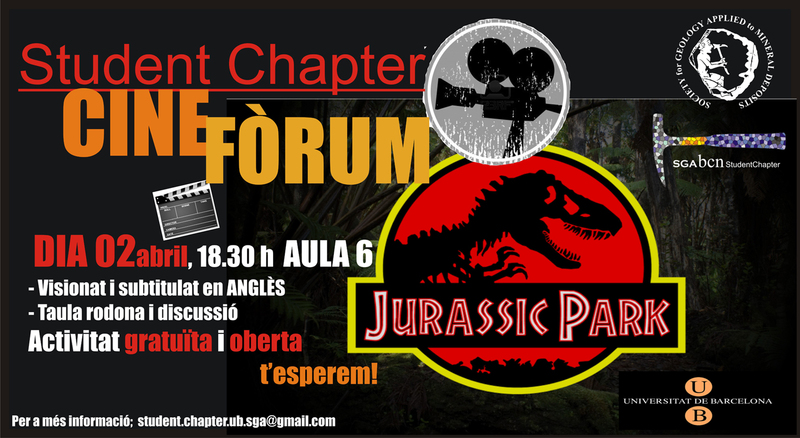 The price for SGA Student members is of 10€ and for non SGA Student members of 20€. Here you can download the registration form. And remember, the number of attendants is limited to 25!! The last July 18th our Student Chapter has the End-of-term party. 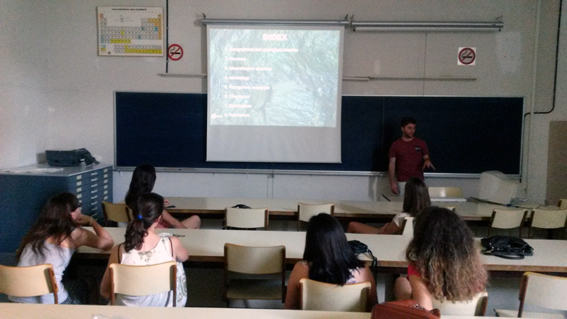 In this party the students gave several talks related to ore deposit topics. The talks were prepared in English and were about 10 minutes long. The aim of these talks is to improve the skills in English speaking and to prepare for future meetings were probably we will have to present our own research. We have to congratulate all the participants because the talks were very well prepared and very interesting. Finally we had lunch together and Cristina brought us a wonderful and tasting cake! 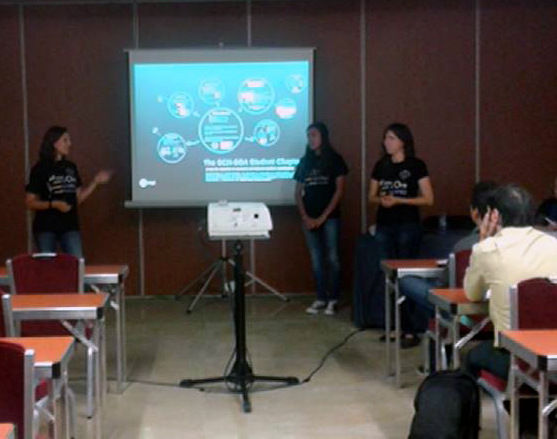 On July the 2nd 2014, our Student Chapter presented a communication in an international meeting about university teaching and innovation, specifically in the field of student participation. 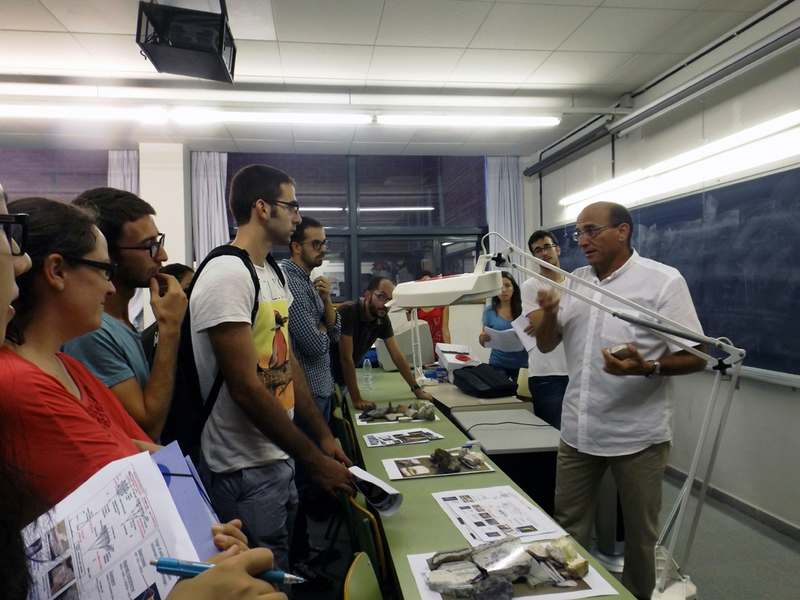 The congress, under the name of CIDUI (International Congress of University Teaching and Innovation), held in Tarragona (Catalonia), was devoted to “flexible training model as response to the current needs”. 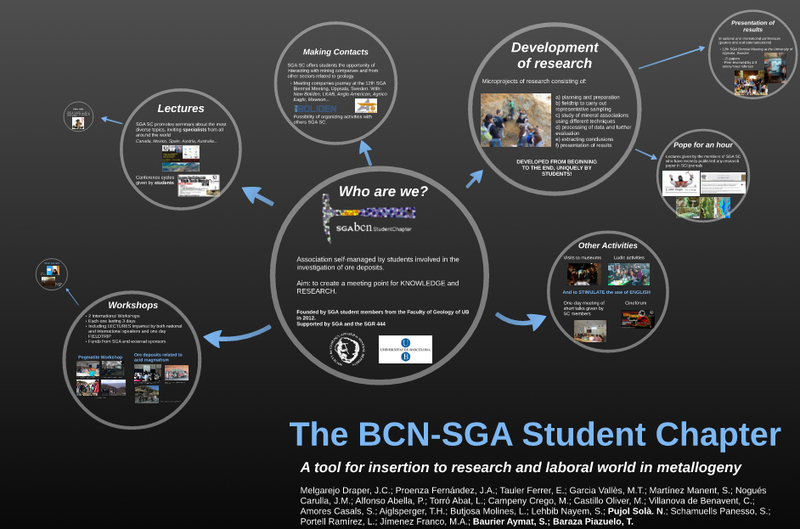 The talk entitled “THE BCN-SGA STUDENT CHAPTER: A tool for insertion to research and laboral world in metallogeny” was presented by three student members: Sandra Baurier, Teresa Baraza and Núria Pujol. Different attendants became interested in this student initiative that can provide a broader formation of students and opportunities for their insertion in the professional world; the three students presenting the communications were congratulated for the work developed by the student chapter so far. Abstract: Garnierites (Ni–Mg-bearing phyllosilicates) are significant ore minerals in some Ni-laterite deposits. In the Falcondo deposit (Dominican Republic), garnierites are found as fracture-fillings and coatings on joints. Different greenish colours and textures can be distinguished, which correspond to different mineral phases, defined according to X-ray diffraction (XRD) and electron microprobe (EMP) analyses: a) talc-like, b) serpentine-like, c) a mixture of talc- and serpentine-like, and d) sepiolite-like. Compositional data indicate continuous Mg–Ni solid solution along the joins lizardite–népouite, kerolite–pimelite and sepiolite–falcondoite. EMP analyses showing deviations from the stoichiometric Mg–Ni solid solutions of serpentine and talc are best explained by talc- and serpentine-like mixing at the nanoscale. A detailed textural study by means of quantified X-ray element imaging provides a wealth of new information about the relationships between textural position, sequence of crystallization and mineral composition of the studied garnierite samples. 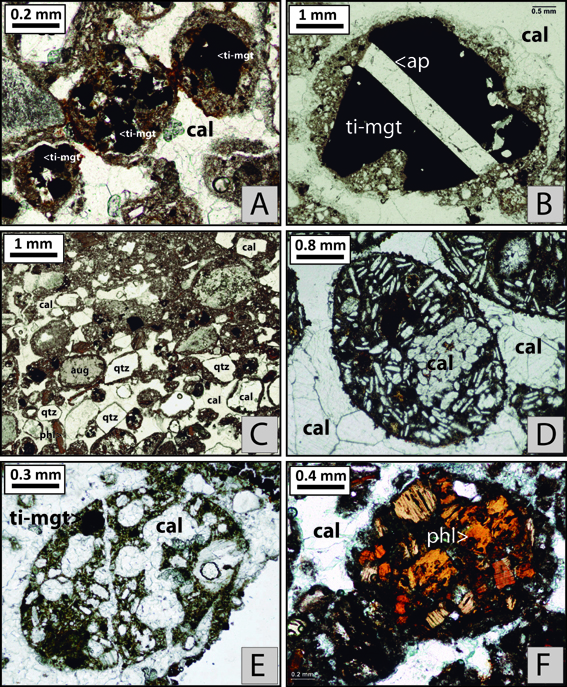 These results indicate several stages of growth with variable Ni content, pointing to recurrent changes in the physical–chemical conditions during garnierite precipitation. In addition, our detailed mineralogical study of the Falcondo garnierites revealed that the different types identified have characteristic H2O content and SiO2/MgO ratios, which play important roles during the pyrometallurgy process. 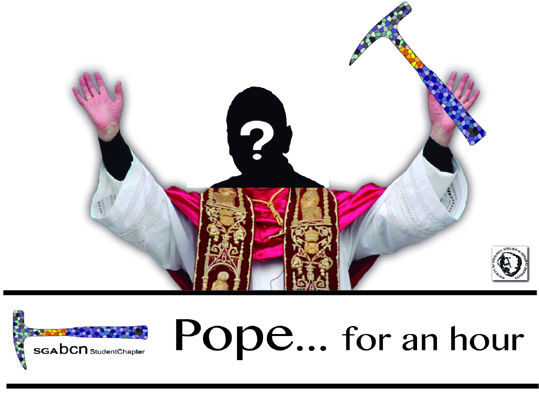 Pope for an hour are talks given by student members of the Barcelona SGA Student Chapter about their recently published research in SCI journals. These talks are adressed to other undergraduate or graduate students as well as to the rest of the scientific community. Abstract: Carbonatite lavas and pyroclastic rocks are exposed in the volcanic graben of Catanda and represent the only known example of extrusive carbonatites in Angola. A new detailed geological map of the area is presented in this study as well as six different stratigraphic sections. Pyroclastic rocks, apparently unwelded, are dominant in the area and represented in all the stratigraphic columns. They form shallowly to moderately inclined layers, mostly devoid of internal structures, that range in thickness from several centimetres to metres. They are dominantly lapilli tuffs and minor tuffs occasionally comprising pelletal lapilli. Based on their different features and field relationships, at least five different pyroclastic lithofacies have been distinguished in the area. Carbonatitic lavas outcrop in the external parts of the Catanda graben, forming coherent layers interbedded with pyroclastic rocks. Calcite is the most common mineral in the lavas, but other accessory minerals such as fluorapatite, titaniferous magnetite, phlogopite; pyrochlore, baddeleyite, monticellite, perovskite, cuspidine and periclase have also been identified. At least four different types of lavas have been distinguished based on their mineral associations and textural features. This study reveals an overall abundance of pyroclastic material in comparison to lava flows in the Catanda area, suggesting that eruptive processes were dominated by explosive activity similar to what has been described in other carbonatite and kimberlite localities. The Catanda carbonatitic volcanism was associated with monogenetic volcanic edifices with tuff ring or maar morphologies, and at least seven possible eruptive centres have been identified in the area. Date: Monday May the 19th 2014, 15.00-17:00h. Abstract: High resolution X-ray computed tomography (CT) is the industrial equivalent of medical CAT scanning and provides a mechanism for non-destructive studies of the three-dimensional nature of geological materials. HRXCT produces two-dimensional images ("slices") that reveal the interior of an object as if it had been sliced open along the image plane for viewing. A CT image is generated by differences in X-ray absorption that arise principally from differences in density within the object. By acquiring a contiguous set of slices, a density map for all or part of a sample volume can be obtained, allowing three-dimensional inspection and measurement of features of interest. 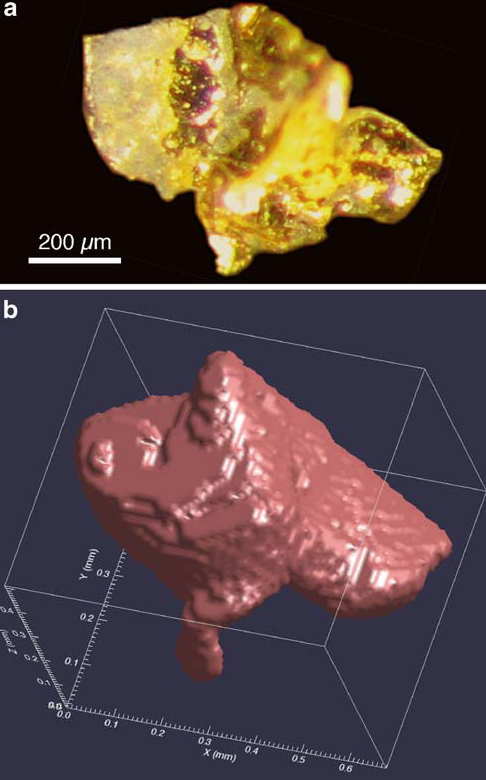 CT is particularly effective in the study of metallic ores that commonly contain minerals spanning the range of densities of natural materials. Available software can produce grain shape, size, and orientation data from the scanned volume, which can be particularly useful for oriented samples. CT precisely defines the in-situ location of mineral grains of interest within a sample, which then can be studied in conventional petrographic sections, and other forms of data collected, e.g. isotope or trace element geochemistry. This talk will review CT principles and diverse applications in geological sciences, with emphasis on ore deposits genetic and applied studies (Kyle et al., 2008; Kyle and Ketcham, in press). Emphasis will be placed on instrumentation, scanning protocols, and studies conducted at the High Resolution X-ray Computed Tomography facility at the University of Texas at Austin http://www.ctlab.geo.utexas.edu. For further information: Kyle, J.R., Mote, A.S., Ketcham, R.A. (2008): High resolution X-ray computed tomography studies of Grasberg porphyry Cu-Au ores, Papua, Indonesia. Mineralium Deposita, 43, 519-532. Abstract: The Ertsberg-Grasberg district in Papua, Indonesia, hosts two giant porphyry and skarn-hosted Cu-Au systems that formed between 3.3 and 2.5 Ma in the Central Range that forms the Highlands of western New Guinea. These Cu-Au systems are associated with two dioritic intrusions, the Grasberg Igneous Complex and the Ertsberg Intrusive Complex, that were emplaced into a deformed sedimentary sequence of Cenozoic carbonate and late Mesozoic siliciclastic strata. Economic mineralization in each of these systems is vertically continuous over at least 1,500 m. Current original ore in place estimations (Leys et al., 2013) indicate that Grasberg-related system contains 7.5 Gt grading 0.70% Cu and 0.64 ppm Au in two deposits, the Grasberg porphyry system and the Kucing Liar skarn. The Ertsberg-related system contains 3.6 Gt grading 0.60% Cu and 0.44 ppm Au in four skarn deposits, the Ertsberg, the Ertsberg East Skarn System, the Dom, and the Big Gossan. All of these deposits represent hypogene mineral concentrations with high complementary gold values, anomalous aspects that makes this district one of the world’s great mineral districts. This talk will present an overview of the University of Texas at Austin’s long term research in the Ertsberg-Grasberg district, with emphasis on the stockwork and skarn mineralization of the Ertsberg Intrusive Complex. 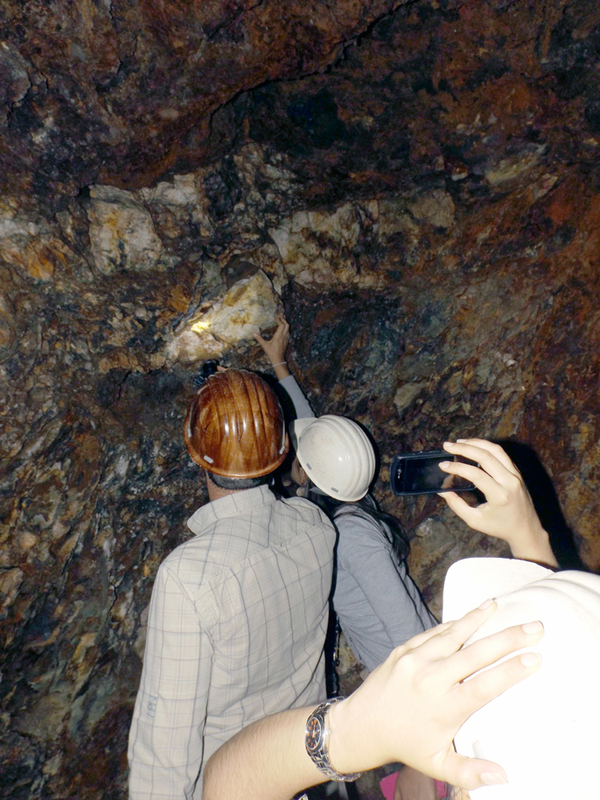 The challenges to exploration, mining, and research forms an appropriate context to review the region’s geologic, tectonic, and mineralization history. 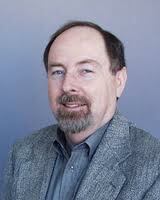 Biografical summary: Rich Kyle is the C. E. Yager Professor of Geology at the University of Texas at Austin. Most of his career has focused on strata-controlled metal and industrial mineral resources in sedimentary terranes. Dr. Kyle has conducted field work in more than 40 countries and has supervised more than 50 graduate and post-doctoral students on diverse research projects ranging from sedimentary basins at near surface to deep burial conditions, as well as the interactions of magmatic hydrothermal systems with reactive wallrocks. He promotes the importance of field experience to complement the traditional classroom education and has led more than 40 major field trips for students, societies, and companies, including last week to Finland and Sweden. Dr. Kyle’s current interests include the application of high resolution X-ray computed tomography to ore deposit studies, microbial involvement in geological processes, and the role of stratigraphic inheritance in controlling stratabound mineralization. He has been active in several professional resource geology organizations, particularly the Society of Economic Geologists, for whom he served as an Associate Editor for Economic Geology, as well as the Thayer Lindsley Lecturer. Dr. Kyle was the Editor-in-Chief for Ore Geology Reviews from 1990 to 2002. Title: X Ray analysis: work strategy and applications (Análisis de imágenes de Rayos X: estrategia de trabajo y aplicaciones). Lecturer: Prof. Antonio García Casco. Dept. de Mineralogía y Petrología - Instituto Andaluz de Ciencias de la Tierra, Facultad de Ciencias (Universidad de Granada, Spain). Date: Tuesday April the 22nd 2014, 12.00h. Abstract: In this talk I shall highlight the merits of X-ray mapping for deciphering the nature of geological (and other) materials and processes. X-ray maps are two dimensional images that describe the distribution (concentration) of elements in an area. They are obtained with electron microscopes on polished areas of samples, which are scanned (beam or stage scanning) for a number of element signals (EDS or WDS) at a time, normally concentrated in major and minor amounts, but trace elements can be also scanned under special machine settings. The raw data can be transformed into quantitative (e.g., wt% element, wt% oxide, atoms per formula unit,…) using internal standards and calibration procedures. The processing of a set of images resembles multispectral analysis of an area, and includes image (matrix) manipulation by means of any mathematical operation/function and treatment for mineral identification, mineral abundance, textural-chemical analysis, mineral composition variation (mineral zonation), element distribution along profiles, binary, ternary or quaternary plotting, etc. Since the images are positioned in absolute X-Y space (stage scanning), they are also useful for planning the analytical strategy of particular points/areas of the objects with the microprobe or other instruments (e.g., LA-ICP-MS). Collecting X-ray maps of an area is time-consuming (several hours or tens of hours), but 2D element maps are invaluable for showing details of phase composition in textural/structural/fabric context which are normally non-appreciated in qualitative optical, BSE, or secondary electron images. The information contained in a full set of X-ray element images of an area is vast and can be extracted after appropriate processing. Hence, this technique has become a necessary tool for providing quantitative information for deciphering phase assemblage (i.e., rock) evolution in space and time. Antonio García Casco, Ph.D. 1993 (University of Granada), is full Professor of Petrology and Geochemistry at the University of Granada. His main research interest are metamorphic geology, phase equilibria, P-T-t paths and experimental petrology, with applications to the geodynamic evolution of plate margins (mostly in the Betics, Variscian and Caribbean belts). He has led several research projects in the Caribbean region. More information available at http://www.ugr.es/~agcasco/personal.